Mine site geology is a fascinating aspect of our work. Wheal Jane Consultancy can provide expert analysis of samples such as those shown below. In May 2018, a large specimen of metasedimentary rock was collected from dumps at Cligga mine near Perranporth. This specimen showed coarse cassiterite crystals lining a joint surface that formed one side of a vein. At first only a few crystals were visible, but careful removal of the chlorite and limonite vein filling revealed a large number of pristine crystals, some up to 10mm. This exceptional example shows that good specimens can still be found with a bit of perseverance. Wood tin is a variety of the mineral cassiterite (tin dioxide – SnO2). It derives its name due from the banded structure it commonly shows, giving it a passing resemblance to wood grain. Where the bands are found as concentric circles of alternating colour, the term ‘Toad’s Eye’ tin has been applied. 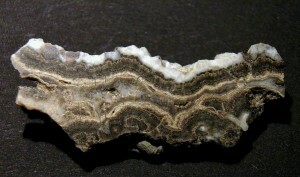 It is believed that wood tin is formed at somewhat lower temperatures than normal cassiterite, possibly even from a gel. Examples of wood tin encrusting needles of bismuthinite from Fowey Consols Mine would in some way support this theory, given the low temperature nature of the bismuthinite. Classic examples of banded wood tins have come from various St Agnes mines, notably Wheal Kitty and West Wheal Kitty. The ancient Wheal Garth mine that is located in the vicinity of Buryas Bridge near Penzance has also produced notable examples of wood tin. Small pebbles containing wood tin can occasionally be found on Trevaunance beach. The large beach pebble pictured is approx 19 x 16 cm and has been sliced through to form two hemispheres. The contact between a tin bearing vein on the right and the dark killas wall rock on the left is clearly visible in the cut face. 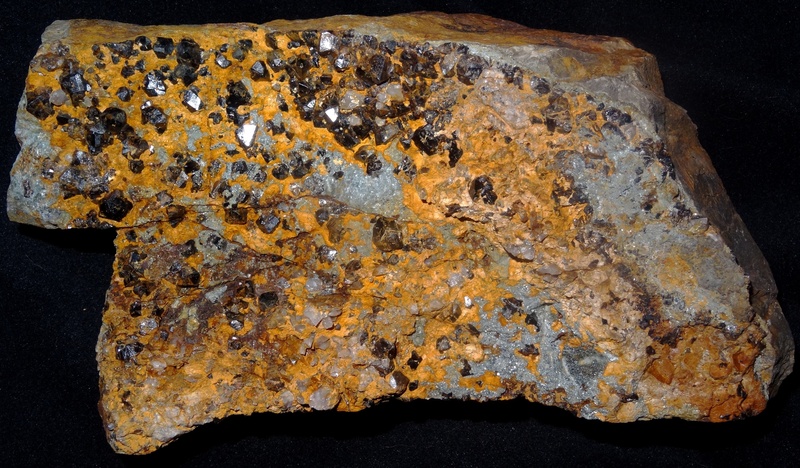 The cassiterite (tin oxide) is visible as brown mineral in the quartz. 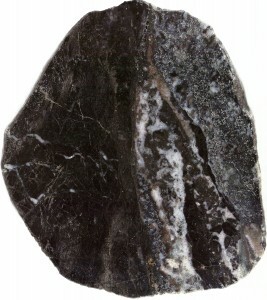 The specimen originates from Porthrepta Beach at Carbis Bay near St Ives, and represents an eroded piece of one of the numerous mineral lodes that were formerly worked in the area.